Goldgenie is the world’s premier gold-plating and customization brand, driven by award-winning entrepreneur Laban Roomes, invested in and supported by BBC Dragon’s Den James Caan. Since being founded in 1995, Goldgenie have established themselves as the go-to customization service for a number of blue-chip organisations – including Lexus, Honda, Toyota and Nokia – and as a global leader in the support of ethical mining. Our Gold Bullion Ingot range is an internationally recognised commodity with real instantaneous monetary value. Goldgenie are literally magicians with gold, true life Midases – if you can think it, they will turn it into 24k gold. Although best known for their high-end gold plating service and whos-who list of royalty and billionaire customers, they produce a range of investment-grade bullion – only in Goldgenie’s case they add a high karat diamond for the ultimate in portable wealth. Variable depending on work. Low premiums. The Goldgenie website is an Aladdin’s cave of exotic artefacts and diamond or crystal encrusted bling – however in amongst the extreme and the unreal, there are a number of solid investment pieces, 999 gold bullion – with all products fully described and beautifully photographed. All questions are answered in detailed FAQ, sections, shipping, terms, and legal information all easily accessible. 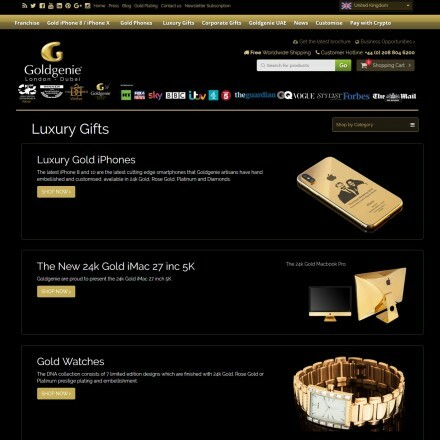 The Goldgenie website is an attractive, modern and easy to navigate website, mostly white or gold on black. Some of the pages can be slow loading at times due to high resolution images and lots of them, but all menus, site sections, e-commerce and cart functions very easy to locate and use. Goldgenie have multiple 5-star reviews across many review centres including Google+, Yelp, Yellow Pages etc and extensive highly-positive coverage in the local, national and international press. 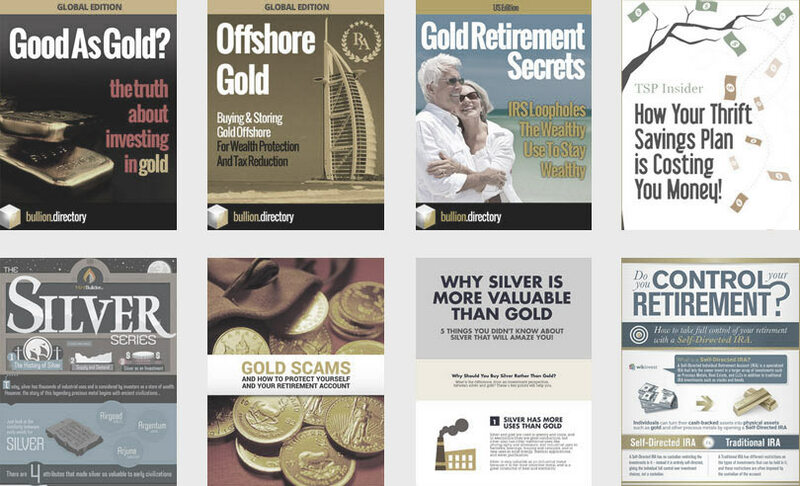 When doing business with Goldgenie - please say you saw them in Bullion.Directory. Read or add Goldgenie reviews and ratings using the "reviews" tab above. All Goldgenie details are believed to be correct at the time of listing. Please report errors here. I’m leaving a review for Goldgenie, my first review I’ve EVER posted online, because I want to share just what a good experience I’ve had. I’ve just gone through the “Goldgenie experience” as I’ve been wanting to buy something beautiful for my wife but something that’s also an investment. I’d heard of Goldgenie from the TV but always thought they only did gold plating which isn’t really my thing, I’m sorry so I never gave them a moments thought. Anyway, I was searching online for solid gold necklaces not jewellery ones but 24k gold ones and apart from an expensive American site called Mean(?) I was getting nothing and saw an image on image search of a bullion bar necklace with a diamond in it which I fell in love with. 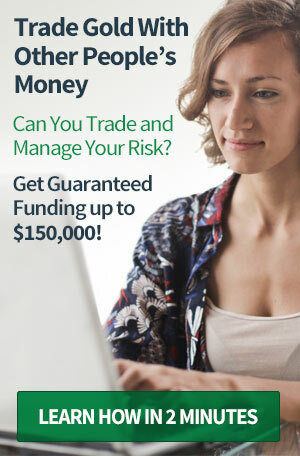 It was on the Goldgenie site and with vat was TEN GRAND. I know that’s a lot, but it was an investment for it’s gold weight and a 1 carrot diamond which I looked up the value of and for one of this quality it was getting on for 7-8k, so with that plus the weight of the gold worth £1800 was actually a bargain and it came in a stunning presentation box. So I paid my money after a call first and they were incredible helpful at every part of the process. Delivery was by courier and came I think it was 3 days after. Now my wife? She absolutely loved it and although it’s an investment she wears it all the time, the funny thing is her friends think it’s fake as nobody wears a gold bullion bar round their neck, or unless its a 9 carrot gold one, not 24k with a big diamond. When it’s not on it’s tucked away in it’s box. I got a call from Goldgenie after it had arrived asking how I was an if I was happy with it and I thought this was a really nice touch, not something you get with other shops. 6 out of 5, seriously if I could. The plating on my 6 held up very well to rough daily use, in and out of pockets all day, sliding around car console, borrowed by my 7 year old, that kind of thing. Only now some of the silver metal below the gold is showing on one corner from rubbing on my jeans. If you take good care of the phone and I truly didnt you’ll have no problems. Utterly delighted with my 24k gold iPhone. It gets comments wherever I go. I should be on commission honestly the amount of people I’ve recommended Goldgenie to.